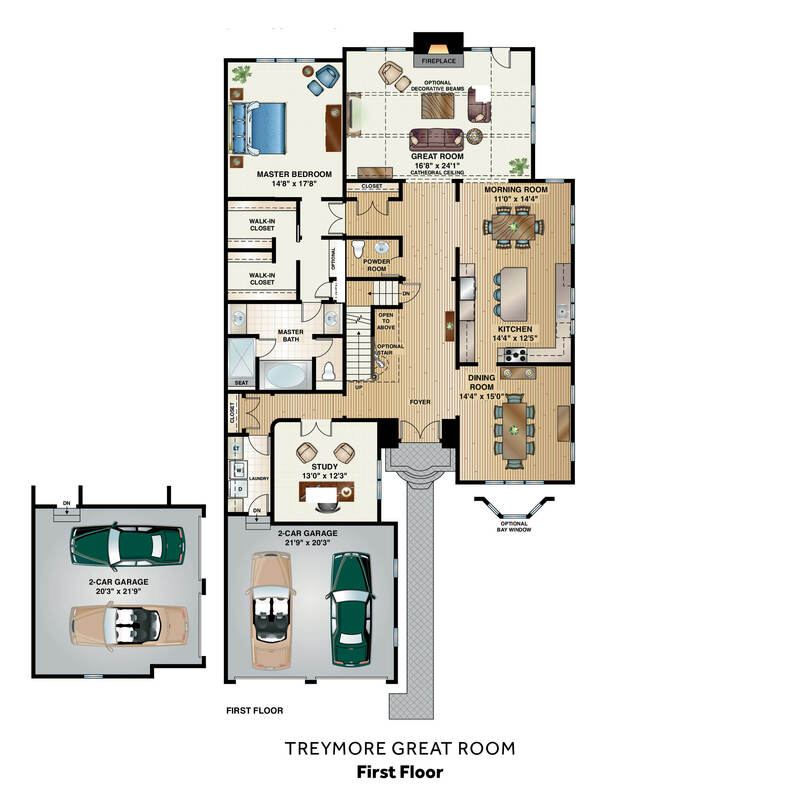 The Treymore combines the comforts of a first floor master suite with a trio of expansive open spaces – the great room, chef’s kitchen and morning room – which form the welcoming heart of this relaxed yet sophisticated residence. The great room's soaring ceiling and cosy fireplace are an irresistible invitation to savor time alone, or with friends or family. Your custom kitchen, with its spacious center island, premium appliances and fine cabinetry, is a perfect setting for a casual breakfast or large-scale entertaining. And while friends and family “cocoon” together, you can retreat to your private suite. From its distinctive high ceiling and dual walk-in closets to the his & hers vanities, luxurious soaking tub and separate shower with seating area, this spa-like retreat may recall your favorite resorts. 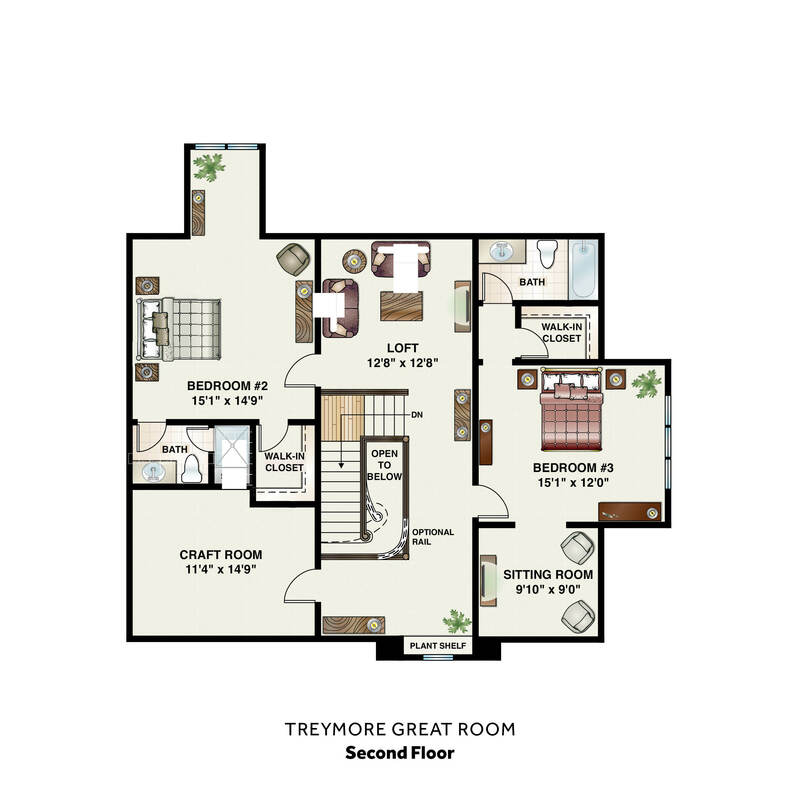 Upstairs, two bedroom suites pamper your guests with walk-in closets, private baths and either an airy loft or sitting room, while the totally customizable lower level invites you to dream. From a home theatre, to the ultimate playroom, to the creative studio you always wanted, if you can imagine it, we can create it. Prices are subject to change without notice. Please call 610-526-9800 or contact us for additional information. Please note: All renderings, floorplans and maps are artist’s conceptions, and may not reflect the exact features included or offered in your home. Square footage and room dimensions are subject to field variations, and details – such as the direction of the hardwood flooring – may change. In order to continually improve our product, we retain the right to change specifications and prices without notice.